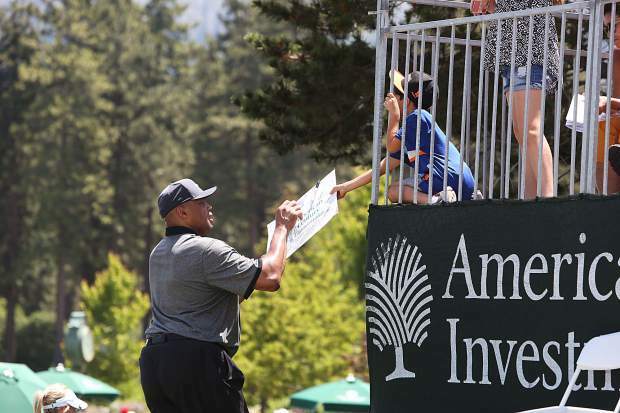 Charles Barkley signs an autograph for a strategically placed youngster at the exit of the 18th green Friday. 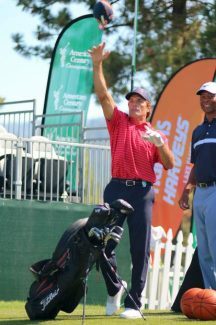 Another American Century Championship (ACC) celebrity golf tournament is in the books, with former Oakland Athletics pitcher Mark Mulder taking the top spot for the third consecutive year and a $125,000 chunk of the $600,000 purse. The 28th annual July tournament held at Edgewood Tahoe Golf Course in Stateline is one of the summer’s biggest draws for Tahonians, as well as the thousands of others spectators who travel to catch a glimpse of the celebrities out on the links. This year had a record number of attendees at 55, 801, which was a 16-percent increase compared to 2016’s 47,109, according to tournament officials. Weidinger has been handling public relations for ACC since 1993. The tournament has gained in popularity, according to Weidinger, not just because of the celebrities, but because it has become such a unique thing offered to the region. 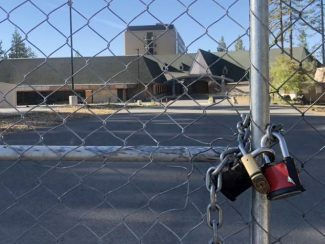 Weidinger said that the community support and support from local organizations like Lake Tahoe Visitors Authority are also big helps in turning the ACC into one of Lake Tahoe’s premiere, national events. One of the celebrity highlights this year was the return of former Dallas Cowboys QB Tony Romo, Weidiner explained. Although there wasn’t a shortage on notable golfers, Romo hadn’t played the ACC in four years, which made his appearance a little more significant. Weidinger went on to add that volunteer help is probably one of the biggest puzzle pieces in making the ACC run as smoothly as it does. There were hundreds of people who volunteered their time and effort during the July 11 through 16 event. Actual tournament play was held from July 14 through 16. Weidinger said that the volunteers, combined with American Century as the title sponsor and NBC on programming, creates an environment of people who are excellent at what they do. 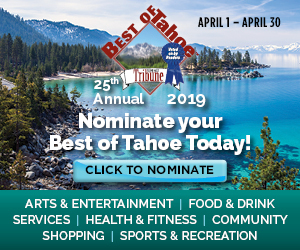 Bryan Davis, Edgewood Tahoe’s director of marketing, said that even with the near 56,000 people that attended, his staff was able to accommodate the needs of the tournament and that there are early indicators of how many people will be coming out. Davis said that the increased numbers during the early week practice rounds gave a pretty good indication that this year was going to break the 2016 attendance record. Davis said that the timing of the tournament just after the Edgewood Tahoe Lodge had opened in June gave people a taste of what the course and its property has to offer. Davis is in agreement with Weidinger in that what really draws in more and more spectators is that this tournament, unlike a typical golf tournament, is all about having fun and scores often tend to be less important. This was something that Weidinger also mentioned, explaining that there is such a diverse blend of athletes and entertainers, but it still works and people enjoy seeing a different celebrity for a different reason. Weidinger said he doesn’t know if the tournament is going to grow even larger, being that the past two years set records in attendance, but Edgewood’s 235-acres would probably allow for it.